PHOTO BY GEREMY BORDONARO/GLEANER NEWS: A fire destroyed a large portion of the dome’s surface for the field at Central Technical School on May 15. 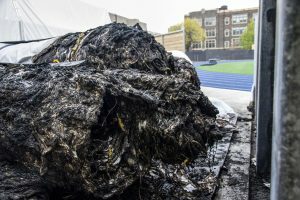 A large portion of the roof of the dome that covers the field at Central Technical School was destroyed in a fire on May 15. The dome was in storage for the summer after it was dismantled on April 27. The cause of the fire remains unknown, but the Toronto Police Service has not ruled out arson. Students were out on the field around mid-afternoon when smoke was spotted coming from the dome’s storage area. Police shut down Bathurst Street south of Bloor Street for a few hours to conduct their investigation, and damage is expected in be in the range of one million dollars.